An investment delegation that consisted of businessmen who took part in the Business Opportunities Forum last week visited the Special Economic Zone at Duqm (SEZD) to learn about the projects that are being implemented and the available opportunities in continuation of the promotional campaign organized by SEZAD in Rome in 22-26 of last September. The delegation consisted of approximately 30 people representing in addition to the Italian investors, investors from Lebanon, France, Brazil, Iran, Germany, Libya, India and Sri Lanka, as well as representatives of the Chambers of Commerce that took part in the Business Opportunities Forum that was organized by Oman Chamber of Commerce and Industry in Oman International Exhibition Centre in 16/17 of this month. Ismail bin Ahmad Al-Balushi, Deputy CEO of the Special Economic Zone Authority in Duqm (SEZAD), said that this visit aims to introduce businessmen to the investment opportunities available at Duqm, and the preparation for it has been going on since the promotional campaign that SEZAD had organized in Italy recently where a number of Italian investors expressed their interests to visit Duqm and to learn more about the projects that are being implemented in the area. We had already coordinated with Oman Chamber of Commerce and Industry to organize this visit. He also confirmed that SEZAD is going ahead in its plans to introduce Duqm and put it on the international map of investment in addition to its efforts to encourage local investments and provide the right environment to facilitate its growth and provide the required facilities. The visit included Port of Duqm, the Drydock, tourism and hotel projects, Duqm Airport, and the Industrial Zone. Abdul Adheem Abbas Al Bahrani, Director General of Oman Chamber of Commerce and Industry, said that the delegation covers a number of investment, commercial and industrial areas, in addition to board members of visiting chambers of commerce. He also confirmed OCCI support to the efforts of SEZAD to promote available investment opportunities at Duqm. He added, “We are working with SEZAD and different governmental and non-governmental establishments to introduce the investment atmosphere in the Sultanate and to attract foreign investments and encourage the local private sector to invest in the country reiterating the OCCI\'s support to all the efforts that contribute to enhancing the performance of the national economy. 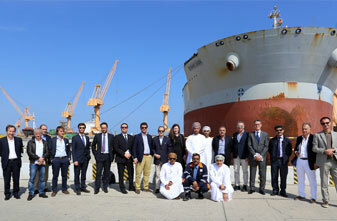 SEZAD, Oman Drydock and Port of Duqm delivered a number of visual presentations during the visit.